In just under 18 months’ time on 5 June 2016 the people of Orkney will mark the centenary of the sinking of HMS Hampshire, with the loss of – we now believe – more than 700 men. By then the 14-metre high Kitchener Memorial, unveiled in 1926 on the west coast of Mainland Orkney, will have been restored and safeguarded for the future. And a more fitting monument will have been created to remember all those men who died along with Earl Kitchener, Britain’s Secretary of State for War, as they attempted to sail from Scapa Flow to Russia. We have had a lively, respectful debate in Orkney about the form this monument should take and I would like to thank everyone who has contributed. The initial suggestions caused some consternation and from the ensuing discussions several things emerged. Principally everyone has agreed that it is right to properly remember all the men who died that night. 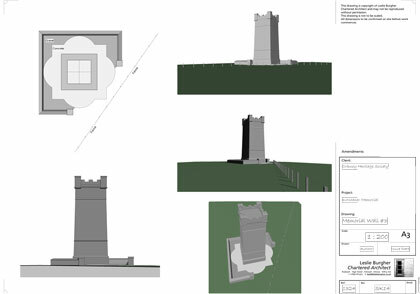 The plans now envisage creating a low wall, a little over a metre high and made from local stone, around four sides of the Kitchener Memorial. The names of the 737 men lost would be inscribed on this wall. Shortly planning applications will be submitted to Orkney Islands Council for this work. The plans would also see the Kitchener Memorial stonework restored to its original condition. The roof would be inspected and repaired, the ventilation reinstated and the former inspection doorway in the memorial restored. However the project, which I am leading on behalf of Orkney Heritage Society, would see this door being kept locked and only opened for maintenance work as unauthorised access to the interior of the tower seemed to be the main concern expressed as a result of the earlier consultation. A project group has been set up by the Orkney Heritage Society to progress the construction work. A number of relatives of those lost with HMS Hampshire, including representatives of Earl Kitchener’s family, have been in touch to support the project and express their appreciation that the people of Orkney want to remember their loss. Both Birsay Community Council and Harray and Sandwick Community Council are supportive of these plans, as are the British Legion and the Royal Naval Association, but I would also like the wider community in Orkney to tell us what they think. Do you feel a wall with its 737 carved names, around a restored Kitchener Memorial, is the right way to commemorate the loss of HMS Hampshire? Should this be called the ‘Hampshire Memorial’? Should the loss of seven others in the following week, when the Laurel Crown hit the same minefield, also be commemorated? Is a wall too much and would a book of remembrance suffice? Some initial ideas for the memorial wall have been worked up by local architect Leslie Burgher. The project group is keen to make sure the ideas fit with the iconic position the tower enjoys, but also provide enough space for the names of those lost. More work will be done on the detail, but the illustrations give a flavour of what is being proposed. As I said before, it is important that whatever proposals are taken forward have the support of Orkney. Expressing your opinions will allow a strong case to be made for funding and ensure that the work is in keeping both with proper commemoration of the losses and the wishes of the people of Orkney. We hope to fund the project through grants but also through public donations. Soon a Just Giving website will launch, through which individuals may donate. This project has been one of discovery – finding out what the public want, meeting people with precious memories, unearthing information – and we have much more to research. For example it was found, early on in the project, that the memorial was not actually built on the land intended for it and was in fact sitting on RSPB land. Elsewhere along the cliff top part of the RSPB reserve was, technically, not theirs but belonged to Orkney Islands Council. I would like to thank employees of both organisations for their help in resolving this by means of a land swap. Please do express any opinion about this project on Facebook (/Kitchener.Memorial) and Twitter (/kitchenerorkney), by email kitchener.memorial@gmail.com or by writing to: Neil Kermode, Quarry House, Finstown, Orkney, KW17 2JY. Or you are welcome to comment on this blog. after all of this there is no map to show the location on Orkney of the memorial.